As an island nation, it is no wonder that there is a strong fascination with all things nautical. Many people in the past would have either been at sea or had a relative who had. It is due to this that ships' fixtures and fittings are often kept as a reminder of a life at sea. Ships' wheels are a common feature, sometimes converted to gates or coffee tables, but instantly recognisable. 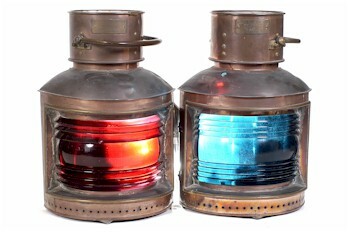 A pair of ship's copper lamps, typical of the ship's fixtures and fittings that we see in our specialist maritime sales. Ships' portholes are common in many sales, as are ships' running lights and lamps. These portholes and lamps can be seen in many properties along the South Coast, where there remains a strong maritime connection. Once again, ships' fixtures and fittings are not restricted to merchant vessels. Not only do many Royal Naval ships' fixtures and fittings such as footplates and anchors turn up for auction, but also Ocean Liner fixtures and fittings. 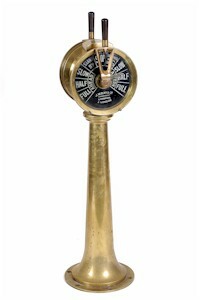 A ship's brass telegraph can command estimates of between £300 and £400 at auction. The brass telegraph illustrated above was produced by J Wray & Co. Ocean liner cabins of the early 20th century were extremely luxurious and well fitted. Collectors of Ocean Liner memorabilia are keen to acquire cabin chairs, deck chairs, cabin lights and Ocean liner dining tables from a period when an Ocean Liner was the only way to travel. As with many antiques, provenance is important to any item's value, and the same is also true for Maritime antiques and ships' fixtures and fittings. The more illustrious the career of a particular ship the greater the value it holds among Maritime antique collectors. Ship's flags and log books are especially emotive of a notable vessel and can give invaluable insight into naval engagements and actions.